Harry Potter film stars Helena Bonham Carter (Bellatrix Lestrange), Tom Felton (Draco Malfoy), Matthew Lewis (Neville Longbottom), James and Oliver Phelps (Fred and George Weasley), Evanna Lynch (Luna Lovegood), and Warwick Davis (Professor Flitwick) attended an exclusive preview of The Wizarding World of Harry Potter – Diagon Alley at Universal Orlando Resort. Arriving on a red carpet that stretched from King’s Cross Station to the picturesque London, the cast celebrated the announcement of The Wizarding World of Harry Potter’s grand opening date of July 8, 2014. 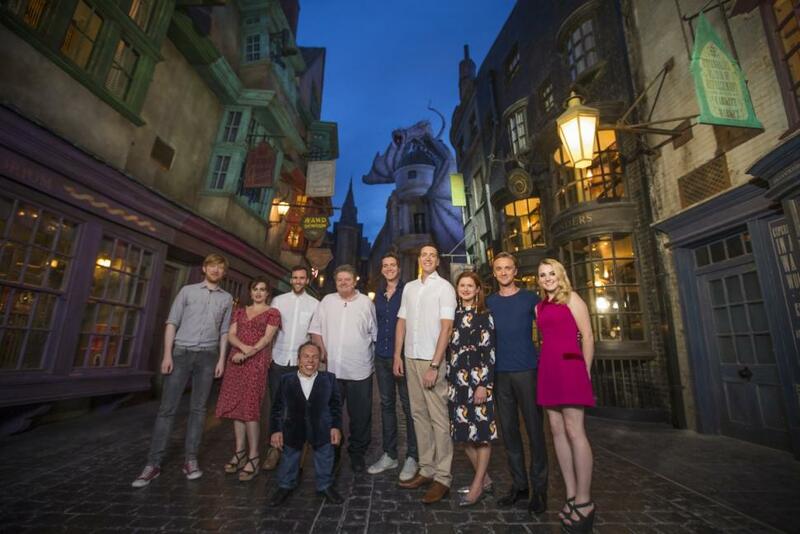 Robbie Coltrane led event attendees inside the land by ceremoniously tapping the bricks of Diagon Alley – just like Rubeus Hagrid did in the Harry Potter books and films. "It's completely impressive once you go in,” said Lewis. “There's nothing to break that illusion. You are in it from the moment you're in there until the moment you leave,"
Felton said “Diagon Alley is far more immersive than the sets he and other cast members inhabited during the filming of the seven movies because there's no scaffolding, no green screen, and no electricians standing around." Bonham Carter, who attended with her two boys and Tim Burton, said from her very first scene in the Harry Potter films, she was surrounded by green as far as the eye can see. With Diagon Alley, she was able to explore the world of J.K. Rowling like never before. 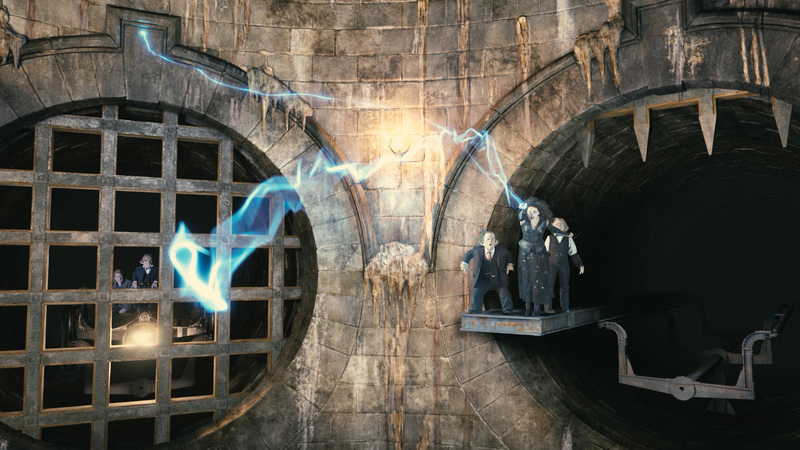 Bonham Carter and Ralph Fiennes reprised their roles from the film for the new 3D ride, Harry Potter and the Escape from Gringotts. 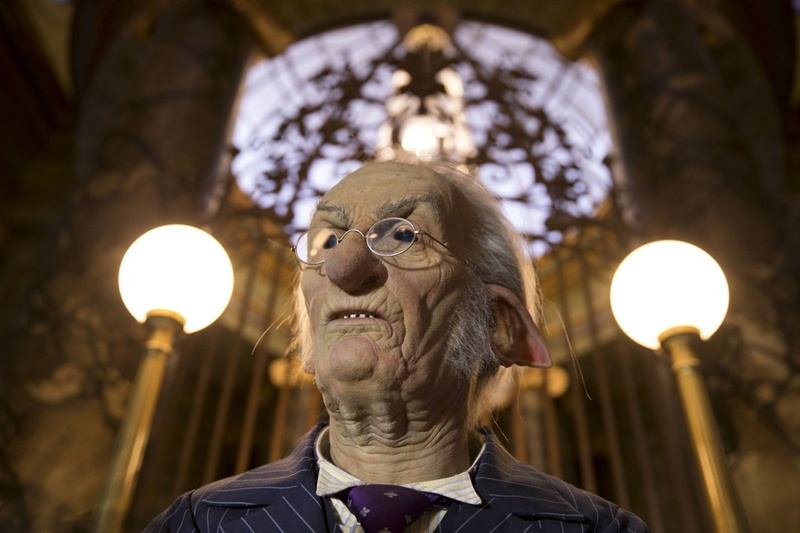 The new attraction uses 4K screens to blend real sets with filmed sequences and special effects as a cart with 360-degree rotation brings guests through the mines below Gringotts. Also back for more Harry Potter adventures were the Phelps twins and Coltrane, who appear in the film footage incorporated in the Hogwarts Express train ride. That attraction connects the two Wizarding World of Harry Potter parks together with one-way service to Hogsmeade and Diagon Alley. Guests will experience a different adventure on board the train each direction. Before these new high-tech rides, actors like the Phelps only had the Harry Potter video games from Electronic Arts to relive their movie experiences. The actors last portrayed their characters in EA’s Harry Potter and the Deathly Hallows video game for Kinect. Oliver Phelps said that game was like none of the other Potter games before it. The Phelps said there was a lot of down time to play video games on set while making the seven feature films. And there was always time for pranks.